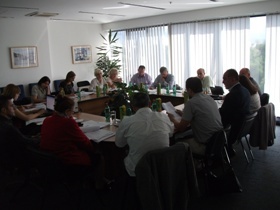 21st October 2014 – Joint session of the Committee for Local Self-Government Financing and the Committee for Spatial Planning and Communal Services was held on October 21st 2014 in Podgorica. The Committee’s members discussed issues that are of a particular importance for a sustainable local self-government financing system and the provision of an efficient system of spatial planning and construction. Particular attention was dedicated to reviewing the Draft Amending Law on Property Tax. Committee’s members have stressed that the proposed legislative solutions would not contribute to the improvement of fiscal policy at the local level. They also expressed the concern that the use of the proposed solutions would not overcome the problem of illiquidity of local self-government budgets and the substitution of lost municipal revenues. Moreover, it would have negative impacts on the budgets of local self-governments. In this regard, special attention was dedicated to the proposals contained in the Draft Amending Law relating to: increasing minimum real estate tax rate ; exemption from paying property tax on buildings and separate parts of a residential building which is in the business books listed as “investors’ stocks of finished products ” intended for further sales for the year the usage permit was issued; determining the lower tax rate for restaurants with 4 **** and more stars, which significantly affects the increase of taxpayers burden (except those who are subjected to proposed exemptions), which would ultimately result in a substantial lower level of collection of income taxes on real estate. After a very constructive discussion, the Position regarding the Draft Law on Amendments to the Law on Property Tax was prepared and submitted to the responsible Ministry of Finance. In the light of the preparation of a new Law on Spatial Planning and Construction and the Draft Amending Law on Real Estate Tax, the relationship and mutual influence of the real estate tax and land development fee were also discussed. They have come to the unique position that the land development fee, as the most productive and the only sustainable source of capital revenues of local self- governments, cannot be abolished, especially not on the basis of increased real estate tax burden. In addition, an initiative for change of use of commercial buildings in residential buildings was discussed, aimed to enable citizens to develop their entrepreneurship initiatives and to adjust housing needs to the current social and economic situation. Prepared initiative will be submitted to the responsible Ministry of Sustainable Development and Tourism.